Emanuel Swedenborg (/ˈswiːdənˌbɔːrɡ/; Swedish pronunciation (help·info); born Emanuel Swedberg; 29 January 1688 – 29 March 1772) was a Swedish Lutheran theologian, scientist, philosopher and mystic. He is best known for his book on the afterlife, Heaven and Hell (1758). Swedenborg had a prolific career as an inventor and scientist. In 1741, at 53, he entered into a spiritual phase in which he began to experience dreams and visions, beginning on Easter Weekend, on 6 April 1744. It culminated in a 'spiritual awakening' in which he received a revelation that he was appointed by the Lord Jesus Christ to write The Heavenly Doctrine to reform Christianity. According to The Heavenly Doctrine, the Lord had opened Swedenborg's spiritual eyes so that from then on, he could freely visit heaven and hell to converse with angels, demons and other spirits and the Last Judgment had already occurred the year before, in 1757. For the last 28 years of his life, Swedenborg wrote 18 published theological works—and several more that were unpublished. He termed himself a "Servant of the Lord Jesus Christ" in True Christian Religion, which he published himself. Some followers of The Heavenly Doctrine believe that of his theological works, only those that were published by Swedenborg himself are fully divinely inspired. Others have regarded all Swedenborg's theological works as equally inspired, saying for example that the fact that some works were "not written out in a final edited form for publication does not make a single statement less trustworthy than the statements in any of the other works". The New Church, a new religious movement comprising several historically-related Christian denominations, reveres Swedenborg's writings as revelation. Swedenborg's father, Jesper Swedberg (1653–1735), descended from a wealthy mining family. The first known paternal ancestor was Otte Persson from Sundborn parish, mentioned 1571. He travelled abroad and studied theology, and on returning home, he was eloquent enough to impress the Swedish king, Charles XI, with his sermons in Stockholm. Through the king's influence, he would later become professor of theology at Uppsala University and Bishop of Skara. Jesper took an interest in the beliefs of the dissenting Lutheran Pietist movement, which emphasised the virtues of communion with God rather than relying on sheer faith (sola fide). Sola fide is a tenet of the Lutheran Church, and Jesper was charged with being a pietist heretic. While controversial, the beliefs were to have a major impact on his son Emanuel's spirituality. Jesper furthermore held the unconventional belief that angels and spirits were present in everyday life. This also came to have a strong impact on Emanuel. In 1703–1709, Swedenborg lived in Erik Benzelius the Younger's house. Swedenborg completed his university course at Uppsala in 1709, and in 1710, he made his grand tour through the Netherlands, France and Germany before reaching London, where he would spend the next four years. It was also a flourishing center of scientific ideas and discoveries. Swedenborg studied physics, mechanics and philosophy and read and wrote poetry. According to the preface of a book by the Swedish critic Olof Lagercrantz, Swedenborg wrote to his benefactor and brother-in-law Benzelius that he believed that Swedenborg might be destined to be a great scientist. In 1715 Swedenborg returned to Sweden, where he devoted himself to natural science and engineering projects for the next two decades. A first step was his meeting with King Charles XII of Sweden in the city of Lund, in 1716. The Swedish inventor Christopher Polhem, who became a close friend of Swedenborg, was also present. Swedenborg's purpose was to persuade the king to fund an observatory in northern Sweden. 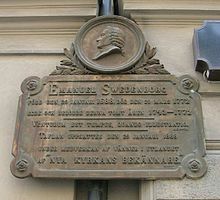 However, the warlike king did not consider this project important enough, but did appoint Swedenborg to be assessor-extraordinary on the Swedish Board of Mines (Bergskollegium) in Stockholm. From 1716 to 1718, Swedenborg published a scientific periodical entitled Daedalus Hyperboreus ("The Northern Daedalus"), a record of mechanical and mathematical inventions and discoveries. One notable description was that of a flying machine, the same he had been sketching a few years earlier. In 1718, Swedenborg published an article that attempted to explain spiritual and mental events in terms of minute vibrations, or "tremulations". In 1724, he was offered the chair of mathematics at Uppsala University, but he declined and said that he had dealt mainly with geometry, chemistry and metallurgy during his career. He also said that he did not have the gift of eloquent speech because of a stutter, as recognized by many of his acquaintances; it forced him to speak slowly and carefully, and there are no known occurrences of his speaking in public. The Swedish critic Olof Lagerkrantz proposed that Swedenborg compensated for his impediment by extensive argumentation in writing. During the 1730s, Swedenborg undertook many studies of anatomy and physiology. He had the first known anticipation of the neuron concept. It was not until a century later that science recognized the full significance of the nerve cell. He also had prescient ideas about the cerebral cortex, the hierarchical organization of the nervous system, the localization of the cerebrospinal fluid, the functions of the pituitary gland, the perivascular spaces, the foramen of Magendie, the idea of somatotopic organization, and the association of frontal brain regions with the intellect. In some cases, his conclusions have been experimentally verified in modern times. In 1735, in Leipzig, he published a three-volume work, Opera philosophica et mineralis ("Philosophical and mineralogical works") in which he tried to conjoin philosophy and metallurgy. The work was mainly appreciated for its chapters on the analysis of the smelting of iron and copper, and it was the work that gave Swedenborg his international reputation. The same year, he also published the small manuscript de Infinito ("On the Infinite") in which he attempted to explain how the finite is related to the infinite and how the soul is connected to the body. It was the first manuscript in which he touched upon such matters. He knew that it might clash with established theologies since he presented the view that the soul is based on material substances. He also conducted dedicated studies of the fashionable philosophers of the time such as John Locke, Christian von Wolff, Gottfried Wilhelm Leibniz, and Descartes and earlier thinkers such as Plato, Aristotle, Plotinus and Augustine of Hippo. In 1743, at the age of 55, Swedenborg requested a leave of absence to go abroad. His purpose was to gather source material for Regnum animale (The Animal Kingdom, or Kingdom of Life), a subject on which books were not readily available in Sweden. The aim of the book was to explain the soul from an anatomical point of view. He had planned to produce a total of 17 volumes. By 1744, Swedenborg had travelled to the Netherlands. Around the time, he began having strange dreams. Swedenborg carried a travel journal with him on most of his travels and did so on this journey. The whereabouts of the diary were long unknown, but it was discovered in the Royal Library in the 1850s and was published in 1859 as Drömboken, or Journal of Dreams. Swedenborg experienced many different dreams and visions, some greatly pleasurable, others highly disturbing. The experiences continued as he traveled to London to progress the publication of Regnum animale. This process, which one biographer has proposed as cathartic and comparable to the Catholic concept of Purgatory, continued for six months. He also proposed that what Swedenborg was recording in his Journal of Dreams was a battle between the love of himself and the love of God. In the last entry of the journal from 26–27 October 1744, Swedenborg appears to be clear as to which path to follow. He felt that he should drop his current project and write a new book about the worship of God. He soon began working on De cultu et amore Dei, or The Worship and Love of God. It was never fully completed, but Swedenborg still had it published in London in June 1745. In 1745, Swedenborg was dining in a private room at a tavern in London. By the end of the meal, a darkness fell upon his eyes, and the room shifted character. Suddenly, he saw a person sitting at a corner of the room, telling him: "Do not eat too much!". Swedenborg, scared, hurried home. Later that night, the same man appeared in his dreams. The man told Swedenborg that he was the Lord, that he had appointed Swedenborg to reveal the spiritual meaning of the Bible and that he would guide Swedenborg in what to write. The same night, the spiritual world was opened to Swedenborg. In June 1747, Swedenborg resigned his post as assessor of the board of mines. He explained that he was obliged to complete a work that he had begun and requested to receive half his salary as a pension. He took up afresh his study of Hebrew and began to work on the spiritual interpretation of the Bible with the goal of interpreting the spiritual meaning of every verse. From sometime between 1746 and 1747 and for ten years henceforth, he devoted his energy to the task. Usually abbreviated as Arcana Cœlestia or under the Latin variant Arcana Caelestia (translated as Heavenly Arcana, Heavenly Mysteries, or Secrets of Heaven depending on modern English-language editions), the book became his magnum opus and the basis of his further theological works. The work was anonymous, and Swedenborg was not identified as the author until the late 1750s. It had eight volumes, published between 1749 and 1756. It attracted little attention, as few people could penetrate its meaning. His life from 1747 to his death was spent in Stockholm, the Netherlands and London. During the 25 years, he wrote another 14 works of a spiritual nature; most were published during his lifetime. The Heavenly Doctrine also teaches that the Last Judgement was followed by the Second Coming of Jesus Christ, which occurred not by Christ in person but by a revelation from him through the inner, spiritual sense of the Word through Swedenborg. In another of his theological works, Swedenborg wrote that eating meat, regarded in itself, "is something profane" and was not practiced in the early days of the human race. However, he said, it now is a matter of conscience, and no one is condemned for doing it. Nonetheless, the early-days ideal appears to have given rise to the idea that Swedenborg was a vegetarian. That conclusion may have been reinforced by the fact that a number of Swedenborg's early followers were part of the vegetarian movement that arose in Britain in the 19th century. However, the only reports on Swedenborg himself are contradictory. His landlord in London, Shearsmith, said he ate no meat, but his maid, who served Swedenborg, said that he ate eels and pigeon pie. In Earths in the Universe, it is stated that he conversed with spirits from Jupiter, Mars, Mercury, Saturn, Venus and the Moon as well as spirits from planets beyond the solar system. From the 'encounters', he concluded that the planets of our solar system are inhabited and that such an enormous undertaking as the universe could not have been created for just one race on a planet or one 'Heaven' derived from its properties per planet. Many Heavenly societies were also needed to increase the perfection of the angelic Heavens and Heaven to fill in deficiencies and gaps in other societies. He argued: "What would this be to God, Who is infinite, and to whom a thousand or tens of thousands of planets, and all of them full of inhabitants, would be scarcely anything!" Swedenborg and the question of life on other planets has been extensively reviewed elsewhere. Swedenborg published his work in London or the Netherlands because of their freedom of the press. In July 1770, at the age of 82, he traveled to Amsterdam to complete the publication of his last work. The book, Vera Christiana Religio (The True Christian Religion), was published there in 1771 and was one of the most appreciated of his works. Designed to explain his teachings to Lutherans, it is the most concrete of his works. In the summer of 1771, he traveled to London. Shortly before Christmas, he suffered a stroke and was partially paralyzed and confined to bed. His health improved somewhat, but he died in 1772. There are several accounts of his last months, made by those with whom he stayed and by Arvid Ferelius, a pastor of the Swedish Church in London, who visited him several times. "As truly as you see me before your eyes, so true is everything that I have written; and I could have said more had it been permitted. When you enter eternity you will see everything, and then you and I shall have much to talk about". He then died, in the afternoon, on the date he had predicted, March 29. He was buried in the Swedish Church in Princes Square in Shadwell, London. On the 140th anniversary of his death, in 1912/1913, his remains were transferred to Uppsala Cathedral in Sweden, where they now rest close to the grave of the botanist Carl Linnaeus. In 1917, the Swedish Church in Shadwell was demolished, and the Swedish community that had grown around the parish moved to Marylebone. In 1938, Princes Square was redeveloped, and in his honour the local road was renamed Swedenborg Gardens. In 1997, a garden, play area and memorial, near the road, were created in his memory. Swedenborg's transition from scientist to revelator or mystic has fascinated many people. He has had a variety of both supporting and critical biographers. Some propose that he did not have a revelation at all but developed his theological ideas from sources which ranged from his father to earlier figures in the history of thought, notably Plotinus. That position was first taken by Swedish writer Martin Lamm who wrote a biography of Swedenborg in 1915. [b] Swedish critic and publicist Olof Lagercrantz had a similar point of view, calling Swedenborg's theological writing "a poem about a foreign country with peculiar laws and customs". Swedenborg's approach to proving the veracity of his theological teachings was to use voluminous quotations from the Old Testament and the New Testament to demonstrate agreement with the Bible, and this is found throughout his theological writings, since he rejected blind faith and declared true faith to be an internal acknowledgement of the truth. The vast use of these Biblical confirmations led a Swedish Royal Council in 1771 to examine the heresy charges of 1770 against two Swedish supporters of his theological writings: "there is much that is true and useful in Swedenborg's writings". Victor Hugo felt that Swedenborg had "lapsed into madness" in Chapter 14 of Les Misérables. Swedenborg proposed many scientific ideas during his lifetime. In his youth, he wanted to present a new idea every day, as he wrote to his brother-in-law Erik Benzelius in 1718. Around 1730, he had changed his mind, and instead believed that higher knowledge is not something that can be acquired, but that it is based on intuition. After 1745, he instead considered himself receiving scientific knowledge in a spontaneous manner from angels. From 1745, when he considered himself to have entered a spiritual state, he tended to phrase his "experiences" in empirical terms, to report accurately things he had experienced on his spiritual journeys. One of his ideas that is considered most crucial for the understanding of his theology is his notion of correspondences. But, in fact, he first presented the theory of correspondences only in 1744, in the first volume of Regnum Animale dealing with the human soul. The basis of the correspondence theory is that there is a relationship among the natural ("physical"), the spiritual, and the divine worlds. The foundations of this theory can be traced to Neoplatonism and the philosopher Plotinus in particular. With the aid of this scenario, Swedenborg now interpreted the Bible in a different light, claiming that even the most apparently trivial sentences could hold a profound spiritual meaning. Swedenborg argued that it is the presence of that spiritual sense which makes the Word divine. Four incidents of purported psychic ability of Swedenborg exist in the literature. There are several versions of each story. On Thursday, 19 July 1759 a great and well-documented fire broke out in Stockholm, Sweden. [c] In the high and increasing wind it spread very fast, consuming about 300 houses and making 2000 people homeless. When the fire broke out Swedenborg was at a dinner with friends in Gothenburg, about 400 km from Stockholm. He became agitated and told the party at six o'clock that there was a fire in Stockholm, that it had consumed his neighbor's home and was threatening his own. Two hours later, he exclaimed with relief that the fire had stopped three doors from his home. In the excitement following his report, word even reached the ears of the provincial governor, who summoned Swedenborg that same evening and asked for a detailed recounting. At that time, it took two to three days for news from Stockholm to reach Gothenburg by courier, so that is the shortest duration in which the news of the fire could reach Gothenburg. The first messenger from Stockholm with news of the fire was from the Board of Trade, who arrived Monday evening. The second messenger was a royal courier, who arrived on Tuesday. Both of these reports confirmed every statement to the precise hour that Swedenborg first expressed the information. The accounts are fully described in Bergquist, pp. 312–313 and in Chapter 31 of The Swedenborg Epic. According to Swedenborg's biographer Lars Bergquist, however, this event took place on Sunday, July 29 – 10 days after the fire. It seems unlikely that the many witnesses to Swedenborg's distress during the fire, and his immediate report of it to the provincial governor, would have left room for doubt in the public eye of Swedenborg's report. If Swedenborg had only received news of the fire by the normal methods there would have been no issue of psychic perception recorded for history. Instead, "when the news of Swedenborg's extraordinary vision of the fire reached the capital, public curiosity about him was very much aroused." A second fire anecdote, similar to the first one, but less cited, is the incident of the mill owner Bolander. Swedenborg warned him, again abruptly, of an incipient fire in one of his mills. Although not typically cited along with these three episodes, there was one further piece of evidence: Swedenborg was noted by the seamen of the ships that he sailed between Stockholm and London to always have excellent sailing conditions. When asked about this by a friend, Swedenborg played down the matter, saying he was surprised by this experience himself and that he was certainly not able to do miracles. In 1763, Immanuel Kant, then at the beginning of his career, was impressed by these accounts and made inquiries to find out if they were true. He also ordered all eight volumes of the expensive Arcana Cœlestia (Heavenly Arcana or Heavenly Mysteries). One Charlotte von Knobloch wrote Kant asking his opinion of Swedenborg's psychic experiences. [f] Kant wrote a very affirmative reply, referring to Swedenborg's "miraculous" gift, and characterizing him as "reasonable, agreeable, remarkable and sincere" and "a scholar," in one of his letters to Mendelssohn, and expressing regret that he (Kant) had never met Swedenborg. Joseph Green, his English friend, who investigated the matter for Kant, including by visiting Swedenborg's home, found Swedenborg to be a "sensible, pleasant and openhearted" man and here again, a scholar. However, three years later, in 1766, Kant wrote and published anonymously a small book entitled Träume eines Geistersehers (Dreams of a Spirit-Seer) that was a scathing critique of Swedenborg and his writings. He termed Swedenborg a "spook hunter" "without official office or occupation". As rationale for his critique, Kant said he wanted to stop "ceaseless questioning" and inquiries about Dreams from "inquisitive" persons, both known and unknown". Kant's friend Moses Mendelssohn thought there was a "joking pensiveness" in Dreams that sometimes left the reader in doubt as to whether Dreams was meant to make "metaphysics laughable or spirit-seeking credible". In one of his letters to Mendelssohn, Kant refers to Dreams less-than-enthusiastically as a "desultory little essay". Kant never closed off the possibility of mysticism or spirits in Dreams of a Spirit-Seer, and the exact relationship of his thought to Swedenborg's remains unclear, according to contemporary scholars. Swedenborg claimed in The Heavenly Doctrine that the teachings of the Second Coming of Jesus Christ were revealed to him. Swedenborg considered his theology a revelation of the true Christian religion that had become obfuscated through centuries of theology. However, he did not refer to his writings as theology since he considered it based on actual experiences, unlike theology, except in the title of his last work. Neither did he wish to compare it to philosophy, a discipline he discarded in 1748 because, he claimed, it "darkens the mind, blinds us, and wholly rejects the faith". The foundation of Swedenborg's theology was laid down in Arcana Cœlestia (Heavenly Mysteries), published in eight Latin volumes from 1749 to 1756. In a significant portion of that work, he interprets the Biblical passages of Genesis and Exodus. He reviews what he says is the inner spiritual sense of these two works of the Word of God. (He later made a similar review of the inner sense of the book of Revelation in Apocalypse Revealed.) Most of all, he was convinced that the Bible describes a human's transformation from a materialistic to a spiritual being, which he calls rebirth or regeneration. He begins this work by outlining how the creation myth was not an account of the creation of Earth, but an account of man's rebirth or regeneration in six steps represented by the six days of creation. Everything related to mankind in the Bible could also be related to Jesus Christ, and how Christ freed himself from materialistic boundaries through the glorification of his human presence by making it Divine. Swedenborg examines this idea in his exposition of Genesis and Exodus. One often discussed aspect of Swedenborg's writing is his ideas on marriage. Swedenborg himself remained a bachelor all his life, but that did not hinder him from writing voluminously on the subject. His work on Marriage Love (Conjugial Love[g] in older translations) (1768) was dedicated to this purpose. A central question with regard to marriage is whether it stops at death or continues into heaven. The question arises due to a statement attributed to Jesus that there is no marriage in heaven (Luke 20:27–38, Matthew 22:23–32, and Mark 12:18–27). Swedenborg wrote The Lord God Jesus Christ on Marriage in Heaven as a detailed analysis of what he meant. The quality of the relationship between husband and wife resumes in the spiritual world in whatever state it was at their death in this world. Thus, a couple in true marriage love remain together in that state in heaven into eternity. A couple lacking in that love by one or both partners, however, will separate after death and each will be given a compatible new partner if they wish. A partner is also given to a person who loved the ideal of marriage but never found a true partner in this world. The exception in both cases is a person who hates chaste marriage and thus cannot receive such a partner. Swedenborg saw creation as a series of pairings, descending from the Divine love and wisdom that define God and are the basis of creation. This duality can be seen in the pairing of good and truth, charity and faith, God and the church, and husband and wife. In each case, the goal for these pairs is to achieve conjunction between the two component parts. In the case of marriage, the object is to bring about the joining together of the two partners at the spiritual and physical levels, and the happiness that comes as a consequence. Swedenborg rejected the common explanation of the Trinity as a Trinity of Persons, which he said was not taught in the early Christian church. There was, for instance, no mention in the Apostolic writings of any "Son from eternity". Instead he explained in his theological writings how the Divine Trinity exists in One Person, in One God, the Lord Jesus Christ, which he said is taught in Colossians 2:9. According to The Heavenly Doctrine, Jesus, the Son of God, came into the world due to the spread of evil here. Swedenborg spoke in virtually all his works against what he regarded as the incomprehensible Trinity of Persons concept. He said that people of other religions opposed Christianity because of its doctrine of a Trinity of Persons. He considered the separation of the Trinity into three separate Persons to have originated with the First Council of Nicaea and the Athanasian Creed. The Heavenly Doctrine rejects the concept of salvation through faith-alone (sola-fide in Latin), since he considered both faith and charity necessary for salvation, not one without the other, whereas the Reformers taught that faith-alone procured justification, although it must be a faith which resulted in obedience. The purpose of faith, according to The Heavenly Doctrine, is to lead a person to a life according to the truths of faith, which is charity, as is taught in 1 Corinthians 13:13 and James 2:20. In other words, Swedenborg spoke sharply against the faith-alone doctrine of Luther and others. He held that justification before God was not based solely upon some imputed righteousness before God, and was not achievable merely by a gift of God's grace (sola gratia), granted without any basis in a person's actual behavior in life. Sola-fide was a doctrine averred by Martin Luther, John Calvin, Ulrich Zwingli and others during the Protestant Reformation, and was a core belief especially in the theology of the Lutheran reformers Martin Luther and Philip Melanchthon. It is very evident from their Epistles that it never entered the mind of any of the apostles that the church of this day would separate faith from charity by teaching that faith-alone justifies and saves apart from the works of the law, and that charity therefore cannot be conjoined with faith, since faith is from God, and charity, so far as it is expressed in works, is from man. But this separation and division were introduced into the Christian church when it divided God into three persons, and ascribed to each equal Divinity. Swedenborg made no attempt to found a church. A few years after his death – 15 by one estimate – for the most part in England, small reading groups formed to study his teachings. As one scholar states, The Heavenly Doctrine particularly appealed to the various dissenting groups that sprang up in the first half of the 18th century who were "surfeited with revivalism and narrow-mindedness" and found his optimism and comprehensive explanations appealing. In the two and a half centuries since Swedenborg's death, various interpretations of his theology have been made, and he has also been scrutinized in biographies and psychological studies. [j] Swedenborg, with his claimed new dispensation, has been considered by some to suffer from mental illness. [k][l] While the insanity explanation was not uncommon during Swedenborg's own time, it is mitigated by his activity in the Swedish Riddarhuset (The House of the Nobility), the Riksdag (the Swedish parliament), and the Royal Swedish Academy of Sciences. Additionally, the system of thought in his theological writings is considered by some to be remarkably coherent. Furthermore, he was characterized by his contemporaries as a "kind and warm-hearted man", "amiable in his meeting with the public", speaking "easily and naturally of his spiritual experiences", with pleasant and interesting conversation... An English friend of Kant's who visited Swedenborg at Kant's behest described Swedenborg as a "reasonable, pleasant and candid man and scholar". Of note here is Swedenborg's statement that he was commanded by the Lord to publish his writings and "Do not believe that without this express command I would have thought of publishing things which I knew in advance would make me look ridiculous and many people would think lies..."
Copies of the original Latin version in which Swedenborg wrote his revelation are available from the following sources. Within parenthesis is the common name used in a New Church listing Then follows the title in its original publication. All the titles listed were published by Swedenborg, except one, The Spiritual Diary, which was not. Various minor reports and tracts have been omitted from the list. ^ For an extensive explanation of the inner spiritual sense of the book of the Apocalypse, see Swedenborg, E. The Apocalypse Revealed Wherein are Disclosed the Arcana Foretold Which Have Hitherto Remained Concealed (Swedenborg Foundation, 1928). ^ The citation "Bergquist (1999)" is used here repeatedly but appears to contain mislabelled quotations. See the "Talk" section of this page under the heading "Bergquist footnote problem". ^ The accounts are fully described in Bergquist, pp. 312–313 and in Chapter 31 of The Swedenborg Epic. The primary source for these accounts is a letter from Immanuel Kant in 1768 and the Swedenborg collection by Tafel (see Further reading). ^ According to Bergquist (1999), pp. 314–315, There are several different accounts of the events which makes it difficult to conclude the exact details of the event. Carl Robsahm (see reference) reports the story in this way. ^ According to Bergquist (1999), p. 316, there are some ten different reports of this event. There are two trustworthy descriptions, one by Robsahm (writing down Swedenborg's own description) and one by a priest who enquired of the woman in a letter fifteen years later. ^ This letter is further discussed in Laywine, A., "Kant's Early Metaphysics". North American Kant Society Studies in Philosophy, volume 3 (Atascadero, California: Ridgeview Publishing Company, 1993), pp. 72–74. ^ "conjugial" should not be confused with "conjugal", the general term for marriage. ^ The trial in 1768 was against Gabrial Beyer and Johan Rosén and was essentially concerned whether Swedenborg's theological writings were consistent with Christian doctrine. A royal ordinance in 1770 declared that writings were "clearly mistaken" and should not be taught. Swedenborg then begged the King for grace and protection in a letter from Amsterdam. A new investigation against Swedenborg stalled and was eventually dropped in 1778. ^ See "Sources" and "Further reading" sections, below. Grieve, Alexander James (1911). "Swedenborg, Emanuel" . In Chisholm, Hugh (ed.). Encyclopædia Britannica. 26 (11th ed.). Cambridge University Press. p. 221. ^ Swedenborg, Emanuel. Encyclopædia Britannica. Retrieved 9 September 2011. and the Encyclopedia of Religion (1987), which starts its article with the description that he was a "Swedish scientist and mystic". Others have not used the term such as Williams-Hogan, Jane (2005) in Encyclopedia of Religion Retrieved 15 July 2013. ^ "Swedenborg, E. Heaven and its Wonders and Hell. From Things Heard and Seen (Swedenborg Foundation, 1946)". Swedenborgdigitallibrary.org. Retrieved 2012-08-16. ^ "The True Christian Religion, Containing the Universal Theology of The New Church Foretold by the Lord in Daniel 7; 13, 14; and in Revelation 21; 1, 2, by Emanuel Swedenborg". Swedenborgdigitallibrary.org. Retrieved 2012-08-16. ^ "Which of Swedenborg's books are Divine revelation?". Swedenborgdigitallibrary.org. Retrieved 2013-08-16. ^ "Swedenborgianism (New Church)". September 2013. Retrieved 6 February 2019. ^ New Jerusalem Church (1788). Reasons for separating from the old church. : In answer to a letter received from certain persons in Manchester, who profess to believe in the heavenly doctrines of the New Jerusalem Church, as contained in the theological writings of the Late Hon. Emanuel Swedenborg, and yet remain in the external forms of doctrine and worship now in use in old church, not withstanding their direct opposition to the heavenly doctrines of the new church. To which are added, sundry passages from E. Swedenborg, on which the expediency, and even necessity, of a complete separation from the former church, is founded. By the Members of the New Jerusalem Church, who assemble in Great East-Cheap, London. R. Hindmarsh. OCLC 508967814. ^ "Riddarhuset – Ätte- och vapendatabas – Swedenborg". 2017-06-04. ^ Svedberg's pietistic interests are described in Bergquist (1999), pp. 230–232. ^ Martin Lamm (1978 ; pp.1–19) notes how all Swedenborg biographies at that draw similarities between the beliefs of Jesper and Emanuel. Lamm himself partially agrees with them, but he maintains that there were marked differences between them too. ^ "Splendors of the Spirit: Swedenborg's Quest for Insight, Part 1". YouTube. Retrieved 2013-07-14. ^ The meeting between the King, Polhelm and Swedenborg is described in detail in Liljegren, Bengt, Karl XII i Lund : när Sverige styrdes från Skåne, (Historiska media, Lund, 1999). ISBN 91-88930-51-3. ^ Proposed by Lagercrantz, also mentioned by Bergquist (1999), p. 119. ^ Gordh, E. et al.Swedenborg, Linnaeus and Brain Research and the Roles of Gustaf Retzius and Alfred Stroh in the Rediscovery of Swedenborg's Manuscripts. Upsala Journal of Medical Sciences 2007; 112:143–164. ^ Gross C. G. Emanuel Swedenborg: A neuroscientist before his time. The Neuroscientist 3: 2(1997). ^ Gross, C. "Three before their time: neuroscientists whose ideas were ignored by their contemporaries] Experimental Brain Research 192:321 2009. ^ Tubbs RS, Riech S, Verma K, Loukas M, Mortazavi M, Cohen-Gadol A. Emanuel Swedenborg (1688–1772): pioneer of neuroanatomy. Childs Nervous System 2011 Aug;27(8):1353-5. ^ Baker, Gregory L. (1983) "Emanuel Swedenborg – An 18th century cosmologist" in The Physics Teacher, October 1983, pp. 441–6 Retrieved 15 July 2013. ^ Bergquist (1999), pp. 142–155. ^ Lamm (1987), pp. 42–43, notes that by assuming that the soul consists of matter, as Swedenborg did, one becomes a materialist. He further notes that it was also noted by contemporaries. ^ Jonsson, Inge, Swedenborg och Linné, in Delblanc & Lönnroth, p. 321. ^ Bergquist (1999), pp. 165–178. ^ Jonsson, Inge, Swedenborg och Linné, in Delblanc and Lönnroth, p.325. ^ Analysis by Bergquist, p. 209. Bergquist has previously published a separate book commenting on the Journal called Swedenborgs drömbok : glädjen och det stora kvalet (Stockholm, Norstedt, 1988). ^ Bergquist (1999), pp. 210–211. ^ Bergquist (1999), pp. 286–287. ^ Cf. Michelle Grier, 'Swedenborg and Kant on Spiritual Intuition' in On the True Philosopher: Essays on Swedenborg, ed. Stephen McNeilly (London: Swedenborg Society, 2002), p. 1. Accessed 2010-11-11. ^ Bergquist (1999), p. 287. ^ Bergquist (1999), p. 288. ^ Jonsson, Inge. Swedenborg och Linné, in Delblanc & Lönnroth, p. 316. ^ Last Judgment, No. 60. ^ Swedenborg, E. Heaven and Its Wonders From Things Heard and Seen (Swedenborg Foundation 1946, #421–535). ^ "Swedenborg, E. The True Christian Religion: Containing the Universal Theology of The New Church Foretold by the Lord in Daniel 7; 13, 14; and in Revelation 21;1,2 (Swedenborg Foundation 1952, paragraphs 193–215)". Swedenborgdigitallibrary.org. Retrieved 2013-08-16. ^ Twigg, Julia (1981). "The vegetarian movement in England, 1847–1981: A study in the structure of its ideology". University of London. ^ Sigstedt, C. The Swedenborg Epic: The life and works of Emanuel Swedenborg Bookman Associates, 1952, p. 476, # 642). ^ Swedenborg, E.The Earths in Our Solar System Which are called Planets and the Earths in the Starry Heaven, and Their Inhabitants; Also the Spirits and Angels There From Things Heard and Seen 1758. Also Rotch Edition. New York: Houghton, Mifflin and Company, 1907, in The Divine Revelation of the New Jerusalem (2012), n. 9-178. ^ Bergquist (1999), p. 477–478. ^ Trobridge, G. Swedenborg, Life and Teaching (Swedenborg Foundation, 1976, p. 272). ^ Bergquist (1999), p. 464. ^ Bergquist (1999), pp. 471–476. Accounts of Swedenborg's last days were collected and published in Tafel II:1, pp. 577 ff, 556 ff, 560 ff. ^ Documents concerning the life and character of Emanuel Swedenborg – Johann Friedrich Immanuel Tafel – Google Books. Books.google.com. Retrieved 2012-08-16. ^ Swedenborg, E. True Christianity, Containing a Comprehensive Theology of the New Church That Was Predicted by the Lord in Daniel 7:13–14 and Revelation 21:1, 2 (Swedenborg Foundation, 2006, Translator's Preface, Vol. 2, p. 36 ff.). ^ "Street map Swedenborg Gardens, map London with Swedenborg Gardens". Ukstreetmap.info. Retrieved 2012-08-16. ^ Ewan-M Ewan Munro+ Add Contact. "Swedenborg Gardens, London Borough of Tower Hamlets, E1 – Flickr – Photo Sharing!". Flickr. Retrieved 2012-08-16. ^ "History of Swedenborg Gardens - eastlondonhistory.com". ^ "Who Was Emanuel Swedenborg (1688–1772)?" An article including a list of biographies about Swedenborg, with a brief analysis of each biographer's point of view. Accessed June 2012. ^ Bergquist (1999), p. 15. ^ en dikt om ett främmande land med sällsamma lagar och seder. Largercrantz (1996), back page. ^ Sigstedt (1952), p. 408. ^ Bergquist (1999), pp. 364–365. ^ Lamm (1987 ), dedicates a chapter to the correspondence theories, pp. 85–109. ^ Bergquist (1999), p. 312. ^ a b "Årtal och händelser i Jönköping". Brandhistoriska.org. Retrieved 2013-07-14. ^ For July 19 date see especially Documents 271–273 in Documents concerning the Life and Character of Emanuel Swedenborg Collected, Translated and Annotated by Tafel, RL. Volume II, Part 1. (Swedenborg Society, British and Foreign. 36 Bloomsbury Street, London, 1877) Retrieved 15 July 2013. ^ "The Swedenborg Epic: Chapter 31". Swedenborgdigitallibrary.org. Retrieved 2013-07-14. ^ Bergquist, L, Swedenborg's Secret (London, The Swedenborg Society, 2005, p. 270). ^ "The Swedenborg Epic: Chapter 38". Swedenborgdigitallibrary.org. Retrieved 2012-08-16. ^ Swedenborg Epic pp. 278ff. ^ a b Sigstedt, p. 329. ^ Johnson 2002. p. 69. ^ Johnson 202, p. 71. ^ Benz 2001, p. 13. ^ Benz 2001, p. 31. ^ Johnson 2002, p. 83. ^ Johnson 2002, p. 123. ^ Johnson 2002, p. 85. ^ Josephson-Storm, Jason (2017). The Myth of Disenchantment: Magic, Modernity, and the Birth of the Human Sciences. Chicago: University of Chicago Press. p. 185-6. ISBN 0-226-40336-X. ^ Quoted by Bergquist (1999), p. 178, based on Swedenborg's Spiritual Experiences (1748), §767 (However, Spiritual Experiences is not among the works Swedenborg published himself, and thus may not be authoritative revelation. See "Which of Swedenborg's books are Divine revelation?" ^ "The Apocalypse Revealed Wherein are Disclosed the Arcana Foretold Which Have Hitherto Remained Concealed". Swedenborgdigitallibrary.org. Retrieved 2012-08-16. ^ Bergquist (1999), pp. 286–309. ^ "ML 1 – Small Canon Search – Reading – The Word of God, The Whole Word of God, and Nothing But the Word of God – Searching the Second Advent Christian Bible – The Second Advent Christian Canon of Scripture". Small Canon Search. Retrieved 2012-08-16. ^ "The Lord God Jesus Christ on Marriage in Heaven". The Swedenborg Project. Retrieved 2013-08-30. ^ "Marriage Love 46–50)". Smallcanonsearch.com. Retrieved 2012-08-16. ^ "Marriage Love No. 52". Smallcanonsearch.com. Retrieved 2012-08-16. ^ "Marriage Love No. 84". Smallcanonsearch.com. Retrieved 2012-08-16. ^ "Marriage Love No. 1". Smallcanonsearch.com. Retrieved 2012-08-16. ^ "Marriage Love No. 117". Smallcanonsearch.com. Retrieved 2012-08-16. ^ "Marriage Love No. 83". Smallcanonsearch.com. Retrieved 2012-08-16. ^ "TCR 175 – Small Canon Search – Reading – The Word of God, The Whole Word of God, and Nothing But the Word of God – Searching the Second Advent Christian Bible – The Second Advent Christian Canon of Scripture". Small Canon Search. Retrieved 2012-08-16. ^ Swedenborg, E. The True Christian Religion, particularly sections 163–184 (New York: Swedenborg Foundation, 1951). ^ "Reformation Faith + Works". Peacebyjesus.witnesstoday.org. Retrieved 2012-08-16. ^ "True Christian Religion, sections 336 ff". Biblemeanings.info. Retrieved 2011-03-06. ^ Benz, E. Emanuel Swedenborg. Visionary Savant in The Age of Reason (translated by Goodrick-Clarke (Swedenborg Foundation, 2002, p. 487). ^ Crompton, S. Emanuel Swedenborg (Chelsea House, 2005, p. 76). ^ Ahlstrom, S. E. A Religious History of the American People (Yale 1972, p. 483). ^ Myers, Jeffrey, Robert Frost: A Biography, Houghton Mifflin, 1996, p. 4. ^ "Arthur Conan Doyle – The History of Spiritualism Vol I Page 02". Classic-literature.co.uk. Retrieved 2012-08-16. ^ Representative men: seven lectures – Ralph Waldo Emerson – Google Boeken. Books.google.com. Retrieved 2012-08-16. ^ Harrison, Kathryn (2009-09-23). "Carl Gustav Jung News – The New York Times". Topics.nytimes.com. Retrieved 2013-07-14. ^ Bergquist (1999), pp. 453–463. ^ "Who was Emanuel Swedenborg (1688–1772)?". Swedenborgdigitallibrary.org. 2006-11-19. Retrieved 2012-08-16. ^ "Man äger ej snille för det man är galen – Wikisource" (in Swedish). Sv.wikisource.org. Retrieved 2012-08-16. ^ Bergquist (1999), p. 474. ^ "The Swedenborg Epic: Chapter 37". Swedenborgdigitallibrary.org. Retrieved 2012-08-16. ^ Trobridge, G.Swedenborg, Life and Teaching (Swedenborg Foundation, 1976, p. 202.). ^ "Emanuel Swedenborg : his life, teachings and influence : Trobridge, George, 1851–1909 : Free Download & Streaming : Internet Archive". Archive.org. Retrieved 2012-08-16. ^ Online text from the Heavenly Doctrines database Archived 2013-09-24 at the Wayback Machine, From Heavenly Doctrine database. 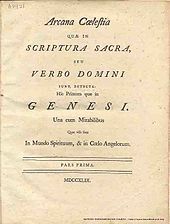 ^ Online photocopy of first Latin edition published by Swedenborg From Bayside Church image database. ^ The original title, and year of publication is based on Bergquist (1999), Litteraturförteckning (pp.525–534). ^ The Works of Emanuel Swedenborg in Chronological Order, Emanuel Swedenborg Studies, accessed February 3, 2011 . ^ "A Swedenborg Bibliography". Archived from the original on 2013-04-03. Ahlstrom, S.E. A Religious History of the American People (Yale 1972) Includes section on Swedenborg by this scholar. Benz, Ernst, Emanuel Swedenborg: Visionary Savant in the Age of Reason (Swedenborg Foundation, 2002) ISBN 0-87785-195-6, a translation of the thorough German language study on life and work of Swedenborg, Emanuel Swedenborg: Naturforscher und Seher by the noted religious scholar Ernst Benz, published in Munich in 1948. Block, M. B. The New Church in the New World. A study of Swedenborgianism in America (Holt 1932; Octagon reprint 1968) A detailed history of the ideational and social development of the organized churches based on Swedenborg's works. Crompton, S. Emanuel Swedenborg (Chelsea House, 2005) Recent biography of Swedenborg. Johnson, G., ed. Kant on Swedenborg. Dreams of a Spirit-Seer and Other Writings. Translation by Johnson, G., Magee, G.E. (Swedenborg Foundation 2002) New translation and extensive set of supplementary texts. Lagercrantz, Olof, Dikten om livet på den andra sidan (Wahlström & Widstrand 1996), ISBN 91-46-16932-6. In Swedish. Moody, R. A. Life after Life (Bantam 1975) Reports correlation of near-death experience with Swedenborg's reports of life after death. Sigstedt, C.,The Swedenborg Epic. The Life and Works of Emanuel Swedenborg (New York: Bookman Associates, 1952). The whole book is available online at Swedenborg Digital Library. Toksvig, Signe (1948). Emanuel Swedenborg, Scientist and Mystic . New Haven: Yale University Press. ISBN 0-87785-171-9 – via Wikisource. The Arms of Morpheus—Essays on Swedenborg and Mysticism, ed. Stephen McNeilly (London: Swedenborg Society, 2007), ISBN 978-0-85448-150-7. Between Method and Madness—Essays on Swedenborg and Literature, ed. Stephen McNeilly (London: Swedenborg Society, 2005), ISBN 978-0-85448-145-3. In Search of the Absolute—Essays on Swedenborg and Literature, ed. Stephen McNeilly (London: Swedenborg Society, 2005), ISBN 978-0-85448-141-5. On the True Philosopher and the True Philosophy—Essays on Swedenborg, ed. Stephen McNeilly (London: Swedenborg Society, 2005), ISBN 978-0-85448-134-7. Jonathan S. Rose, ed. Emanuel Swedenborg: Essays for the New Century Edition on His Life, Work, and Impact (West Chester, Pennsylvania: Swedenborg Foundation, 2002), ISBN 0-87785-473-4. 580 pages. Multiple scholars contributed to this collection of information on Swedenborg, his manuscripts, and his cultural influence. Republished in 2004 under new title, Scribe of Heaven: Swedenborg's Life, Work, and Impact ISBN 0-87785-474-2. "The Madness Hypothesis," a special issue of The New Philosophy (1998;101: whole number), a journal produced by the Swedenborg Scientific Association, reviews the question of Swedenborg's sanity in scholarly detail, making the case that he was in fact quite sane. Nemitz, K., "The Man and His Work". Sig Synnestvedt, ed., The Essential Swedenborg: Basic Religious Teachings of Emanuel Swedenborg. Swedenborg Foundation, 1970. J. G. Herder's "Emanuel Swedenborg," in his Adrastea (Werke zur Phil. und Gesch., xii. 110–125). Transactions of the International Swedenborg Congress (London, 1910), summarized in The New Church Magazine (August 1910). Ralph Waldo Emerson, "Swedenborg; or, the Mystic", in Emerson: Essays and Lectures (New York, New York: The Library of America, 1983), ISBN 978-0-940450-15-8. 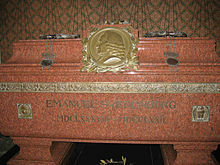 Wikimedia Commons has media related to Emanuel Swedenborg.